Visit Optimum Chiropractic and Health Center and see how Dr. Reza Nikpour takes a comprehensive approach to pain relief and wellness. Visit your Sheboygan chiropractor,Dr. 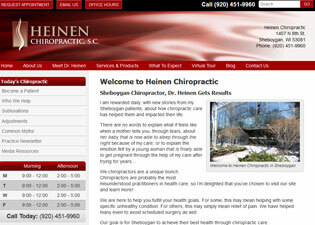 Kenneth Heinen at Heinen Chiropractic . We strive to improve your health by offering a natural way to live a wellness lifestyle.